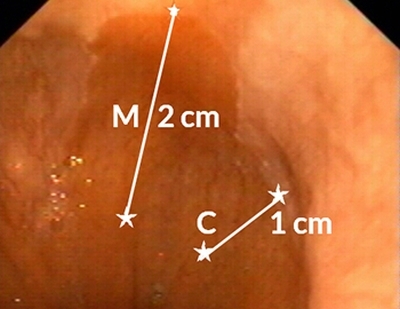 The Prague classification was presented by an international research group in 2006 (1) and has since been regarded as the standard for measuring the length of Barrett’s esophagus. 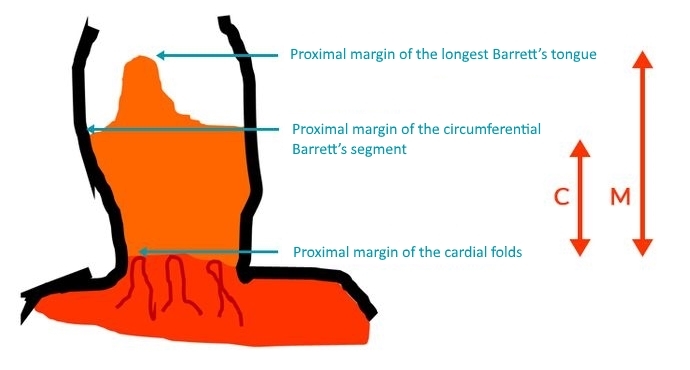 The lower measurement boundary is formed by the proximal cardial notch (optimally with moderate insufflation), and the two upper measurement boundaries are marked by the proximal limit of the circumferential Barrett’s segment (C) and the longest tongue of Barrett’s (M). 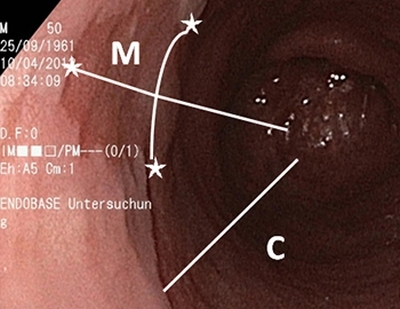 An error that is often made is to use M to state only the length of the tongue above the circumferential segment, which initially appears logical in the endoscopic report; but M does not measure the length of the tongue, but rather the longest Barrett’s segment (m = maximum), including the longest tongue. M therefore has to be at least as long as C (M ≥ C). In the following illustration, the circumferential segment (C) is 3 cm and the tongue an additional 2 cm, so that M is 5 cm (3 cm circumferential + 2 cm tongue = 5 cm maximum Barrett’s extent, M). The length of the Barrett’s is thus C3M5. 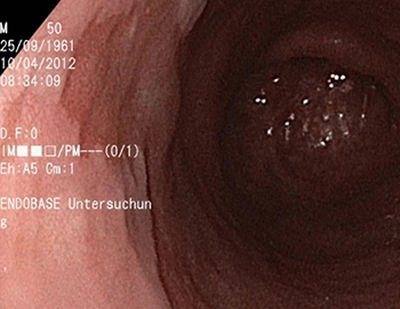 A short Barrett’s segment only forming a 1-cm tongue is reported as C0M1. 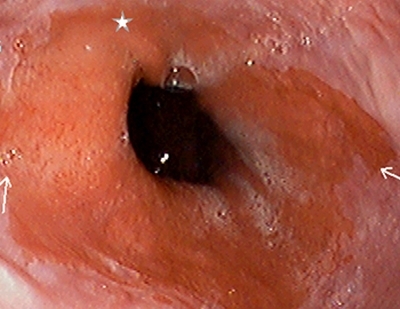 A circular Barrett’s that is 2 cm long without tongues — i.e., with a relatively straight proximal boundary —is reported as C2M2. 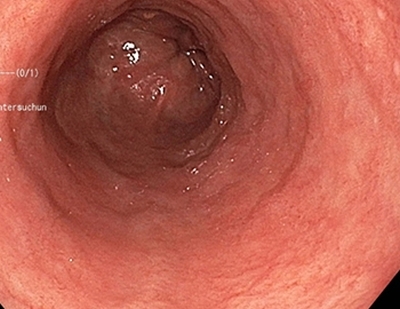 Short Barrett’s segment with a 1-cm long circular section (C) and an additional 1-cm long tongue. In the Prague classification, it is therefore C1M2. 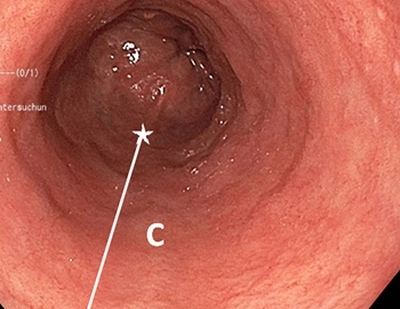 Long Barrett’s segment with a 7-cm long circular section (C), measured from the proximal cardial notch, which is still just visible distally (the upper margin is no longer present on this image), and with an additional short tongue (1 cm). In the Prague classification, it is therefore C7M8. 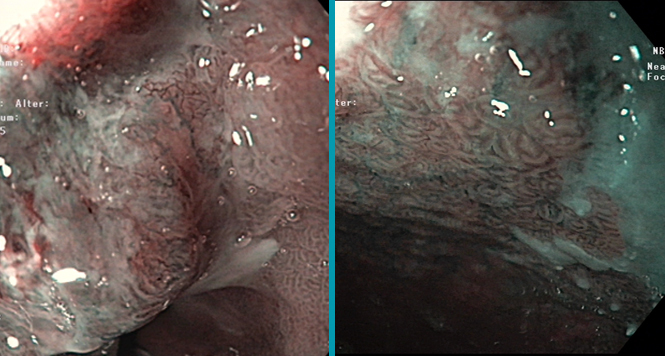 The transition from gastric to Barrett’s mucosa is rarely seen as clearly as it is here due to the different vascular patterns (in this case with narrow-band imaging). 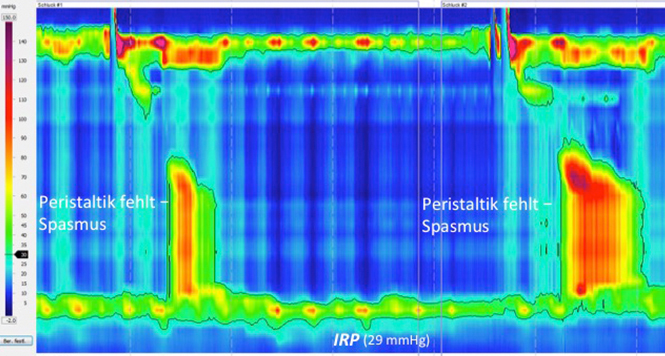 A short Barrett’s segment, mainly tongue-shaped (arrows), but in different phases of insufflation and respiration. 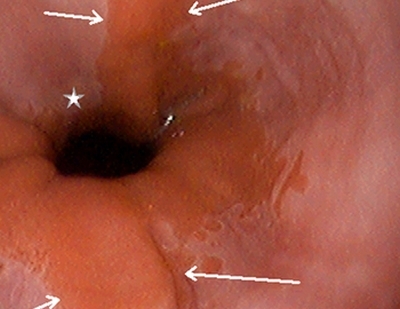 In the left image, two tongues can be seen and the circular part is interrupted (*); on the right, the esophagogastric junction has slipped slightly proximally, but at least one cardial fold can be seen that extends as far as the Z-line (**). This Barrett’s would therefore be described not as having a circular part, but only one 1-cm long tongue-shaped section — i.e., C0M1. However, this is of course open to a certain amount of interpretation. 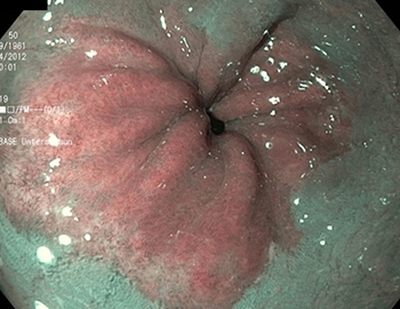 A similar case of a short Barrett’s segment, mainly tongue-shaped (top left) in a view with a closed lumen. When the lumen is open, the situation initially remains unclear (top right); after irrigation and cleaning, on full insufflation (bottom left) the circular section appears unclear, but in any case short, while with moderate insufflation (bottom right) the cardial folds then extend to the Z-line at some points (*). C0 would therefore be reported here. The length of the maximum Barrett’s tongue is around 2 cm, so that overall this is a C0M2 Barrett’s segment. Again, however, this is open to a certain amount of interpretation.